Chris Statton and Megan Wilson inside ATA’s storefront. Photo by Daniel Hirsch. If you’re an artist in San Francisco these days, securing affordable studio space in which to work is no easy task. It often means getting creative. Chris Statton and Megan Wilson may know this better than anyone—Wilson herself was evicted last year from her longtime studio at 340 Bryant. As members of Clarion Alley Mural Project, they’ve worked long hours out of doors, installed in movie theater lobbies (they painted the interior of the Roxie in 2012), and even turned homes into a studio/installation (as Wilson did from 1996 to 2008). For the rest of the month, the storefront window of Artist Television Access (ATA) will be the temporary home for Statton and Wilson’s work—home being the operative word. As part of their project “Better Homes & Better Gardens Today,” Statton and Wilson aim to create up to 300 wooden signs painted with the word “Home” in 15 different languages. Everyday from about 10 to 6, they’ll be undertaking this endeavor from the confines of ATA’s storefront. On Wednesday afternoon, Wilson estimated they already had at least 150 signs in various stages of completion. “The first weekend we were here, it was so hot, papers taped to the window were melting off,” Statton said. Though the temperature had dropped since the weekend, the roughly 35-square-foot space felt warm in the midday heat. As part of the project, Wilson and Statton will also hold an event on October 29 and 30th at ATA in which they’ll invite employees of tech companies such as Twitter, Zendesk, Yammer, Google and Salesforce who “have expressed interest in helping to make a difference to ease the suffering experienced by those living on the street.” The evening will have presentations on homelessness and open discussion as well as opportunities to donate to Statton and Wilson’s partner organizations. “If you have money and you see need, you need to pay your fair share,” Statton said. Being on display as they work in the storefront mirrors the experience of being on the street. Statton says it’s challenging “being exposed to the energy of the people going by all day; if I was on the street, I’d understand how exhausting it can be.” Though it’s not all draining. The occasional drunk gawker aside, Statton and Wilson have received many thumbs ups, appreciative bows, and several people stopping to talk to the artists. Statton says he does a little dance for children captivated by the two human beings in what is usually a display case. “Better Homes & Better Gardens Today” is a continuation of work and themes Statton and Wilson have been exploring for the better part of a decade. 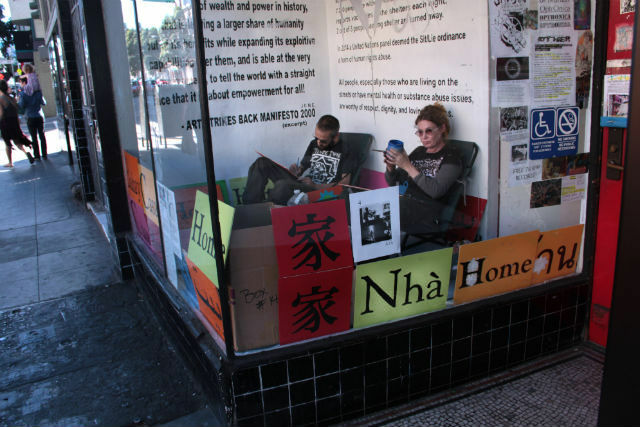 In fact, a 14-year-old “Home” sign Wilson painted sits above the Valencia Street storefront from the 2000 project “Art Strikes Back,” created by a group of artists in response to the wave of gentrification in the dot-com boom. It’s not the first time an artist has occupied ATA’s storefront either. Artist John Fanning lived in the window space for an entire month in 2000. By spending 24 hours a day in the storefront, Fanning wanted to draw attention to displacement and the lack of affordable housing. Finding the right home in San Francisco has never been easy. Saw that. Thank god for ATA, one of few interesting spaces left on Valencia.